For Orthodox Christians the lives of the saints function not only as lesson in holiness, morality or zeal, but most importantly as evidence. 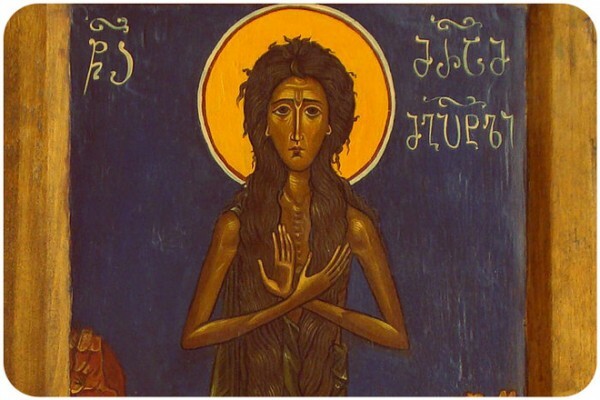 Hitting the Wall – What happened with St. Mary of Egypt? In the Holy Orthodox Church on the fifth week of Great Lent we read the life of St. Mary of Egypt: out loud, as part of compline. St. Mary is a repentant harlot who lived as a hermit for forty-seven years in the wilderness east of the Jordan River in the early sixth century. Near the end of her life, she is found by a certain monk from the monastery of St. John the Baptist, Fr. Zosimas, to whom she tells her story. In the normal course of the liturgical life of the Church, the Synaxarion (book of the lives of the Saints) is read every day at Matins. For Orthodox Christians the lives of the saints function not only as lesson in holiness, morality or zeal, but most importantly as evidence. The saints are evidence that men and women can indeed be holy, we can indeed participate in the very Life of God. And in the Church, we tell these stories again and again because we fall into weakness and doubt so easily. Saints come in all shapes and sizes, you might say. There is not just one way to become a saint. Some saints have been killed or tortured for their faith. Others have lived lives of stillness and prayer. Others have lived lives of service and love. Each woman or man must follow the path of holiness laid down before him or her. 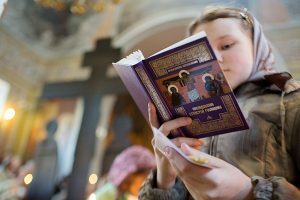 In fact, the Orthodox Church does not even have an official process by which one is recognized and canonized as a saint. Sanctity is recognized and venerated by the people and eventually officially recognized by the bishops. Often saints are local, known only by the people in the area where the saint lived. Other saints so encourage the faithful that they are well known the world over. Through her terribly destructive lifestyle, she was looking for life. And so Life found her. St. Mary stumbles across a group of pilgrims going to Jerusalem to see the Cross of Christ, and she goes along with them. I’ll let you read the details of the beginning of her repentance yourself. Toward the end of her repentance (forty-seven years later), she is found by Fr. Zosimas, an old man who had lived since age three in the monastic life as a model of holiness. Fr. Zosimas had a thought: there is no monk who can teach me. And so God sent him into the desert beyond the Jordan to meet Mary. Again, I will let you read the details of the encounter. But there are two things I would like to point out. I think these are central lessons we are to learn from retelling the life of this saint. First, even those who live terrible lives may indeed be seeking Life in the only ways they know how. Ours is not to judge, but rather to seek Life as best we can according to what we know–or think we know. Those who do not seek Life the way we do, these we commit to God who is Life and is able to lead to Himself all who are seeking him–even those who seek in all of the wrong places. Second, and this I think is why the story is read towards the end of Great Lent, the masters of the tried and true, traditional ways of seeking God are not necessarily the holiest children God has. Jesus tells us that she who is forgiven much loves much. During this last week of Lent, perhaps we will grow more in our relationship with God if we focus less on what we have done for God and more on what we have been forgiven. May Holy Mary pray for us. “It is good to hide the secret of a king, but it is glorious to reveal and preach the works of God” (Tobit 12:7) So said the Archangel Raphael to Tobit when he performed the wonderful healing of his blindness. Actually, not to keep the secret of a king is perilous and a terrible risk, but to be silent about the works of God is a great loss for the soul. 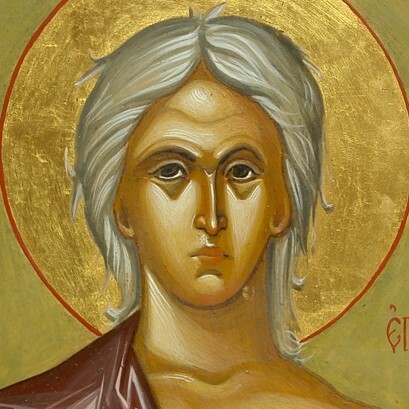 And I (says St. Sophronius), in writing the life of St. Mary of Egypt, am afraid to hide the works of God by silence. Remembering the misfortune threatened to the servant who hid his God-given talent in the earth (Mat. 25:18-25), I am bound to pass on the holy account that has reached me. And let no one think (continues St. Sophronius) that I have had the audacity to write untruth or doubt this great marvel –may I never lie about holy things! If there do happen to be people who, after reading this record, do not believe it, may the Lord have mercy on them because, reflecting on the weakness of human nature, they consider impossible these wonderful things accomplished by holy people. But now we must begin to tell this most amazing story, which has taken place in our generation. After this, Zosimas bowed to the abbot, asked for his prayers and blessing, and stayed in the monastery. There he saw elders proficient both in action and the contemplation of God, aflame in spirit, working for the Lord. They sang incessantly, they stood in prayer all night, work was ever in their hands and psalms on their lips. Never an idle word was heard among them, they know nothing about acquiring temporal goods or the cares of life. But they had one desire — to become in body like corpses. Their constant food was the Word of God, and they sustained their bodies on bread and water, as much as their love for God allowed them Seeing this, Zosimas was greatly edified and prepared for the struggle that lay before him. Many days passed and the time drew near when all Christians fast and prepare themselves to worship the Divine Passion and Resurrection of Christ. The monastery gates were kept always locked and only opened when one of the community was sent out on some errand. It was a desert place, not only unvisited by people of the world but even unknown to them. There was a rule in that monastery which was the reason why God brought Zosimas there. At the beginning of the Great Fast [on Forgiveness Sunday] the priest celebrated the holy Liturgy and all partook of the holy body and blood of Christ. After the Liturgy they went to the refectory and would eat a little Lenten food. Then all gathered in church, and after praying earnestly with prostrations, the elders kissed one another and asked forgiveness. And each made a prostration to the abbot and asked his blessing and prayers for the struggle that lay before them. After this, the gates of the monastery were thrown open, and singing, “The Lord is my light and my Savior; whom shall I fear? The Lord is the defender of my life; of whom shall I be afraid?” (Psalm 26:1) and the rest of that psalm, all went out into the desert and crossed the River Jordan. 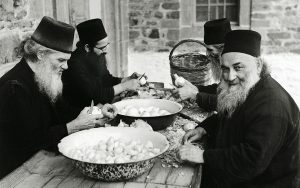 Only one or two brothers were left in the monastery, not to guard the property (for there was nothing to rob), but so as not to leave the church without Divine Service. Each took with him as much as he could or wanted in the way of food, according to the needs of his body: one would take a little bread, another some figs, another dates or wheat soaked in water. And some took nothing but their own body covered with rags and fed when nature forced them to it on the plants that grew in the desert. After crossing the Jordan, they all scattered far and wide in different directions. And this was the rule of life they had, and which they all observed — neither to talk to one another, nor to know how each one lived and fasted. If they did happen to catch sight of one another, they went to another part of the country, living alone and always singing to God, and at a definite time eating a very small quantity of food. In this way they spent the whole of the fast and used to return to the monastery a week before the Resurrection of Christ, on Palm Sunday. Each one returned having his own conscience as the witness of his labor, and no one asked another how he had spent his time in the desert. Such were rules of the monastery. Everyone of them whilst in the desert struggled with himself before the Judge of the struggle — God — not seeking to please men and fast before the eyes of all. For what is done for the sake of men, to win praise and honor, is not only useless to the one who does it but sometimes the cause of great punishment. Zosimas did the same as all. And he went far, far into the desert with a secret hope of finding some father who might be living there and who might be able to satisfy his thirst and longing. And he wandered on tireless, as if hurrying on to some definite place. He had already walked for 20 days and when the 6th hour came he stopped and, turning to the East, he began to sing the sixth Hour and recite the customary prayers. He used to break his journey thus at fixed hours of the day to rest a little, to chant psalms standing and to pray on bent knees. Here terror seized Zosimas, for he heard that she called him by name. But he realized that she could not have done so without knowing anything of him if she had not had the power of spiritual insight. The elder wept and the woman began her story. “My native land, holy father, was Egypt. Already during the lifetime of my parents, when I was twelve years old, I renounced their love and went to Alexandria. I am ashamed to recall how there I at first ruined my maidenhood and then unrestrainedly and insatiably gave myself up to sensuality It is more becoming to speak of this briefly, so that you may just know my passion and my lechery. for about seventeen years, forgive me, I lived like that. I was like a fire of public debauch. And it was not for the sake of gain — here I speak the pure truth. Often when they wished to pay me, I refused the money. I acted in this way so as to make as many men as possible to try to obtain me, doing free of charge what gave me pleasure. do not think that I was rich and that was the reason why I did not take money. I lived by begging, often by spinning flax, but I had an insatiable desire and an irrepressible passion for lying in filth. This was life to me. Every kind of abuse of nature I regarded as life. “That youth, on hearing my shameless words, laughed and went off. While I, throwing away my spinning wheel, ran off towards the sea in the direction which everyone seemed to be taking. and, seeing some young men standing on the shore, about ten or more of them, full of vigor and alert in their movements, I decided that they would do for my purpose (it seemed that some of them were waiting for more travelers whilst others had gone ashore). Shamelessly, as usual, I mixed with the crowd, saying, `Take me with you to the place you are going to; you will not find me superfluous.’ I also added a few more words calling forth general laughter. Seeing my readiness to be shameless, they readily took me aboard the boat. Those who were expected came also, and we set sail at once. How shall I relate to you what happened after this? Whose tongue can tell, whose ears can take in all that took place on the boat during that voyage! And to all this I frequently forced those miserable youths even against their own will. There is no mentionable or unmentionable depravity of which I was not their teacher. I am amazed, Abba, how the sea stood our licentiousness, how the earth did not open its jaws, and how it was that hell did not swallow me alive, when I had entangled in my net so many souls. But I think God was seeking my repentance. For He does not desire the death of a sinner but magnanimously awaits his return to Him. At last we arrived in Jerusalem. I spent the days before the festival in the town, living the save kind of life, perhaps even worse. I was not content with the youths I had seduced at sea and who had helped be to get to Jerusalem; many others — citizens of the town and foreigners — I also seduced. The holy day of the Exaltation of the Cross dawned while I was still flying about — hunting for youths. At daybreak I saw that everyone was hurrying to the church, so I ran with the rest. When the hour for the holy elevation approached, I was trying to make my way in with the crowd which was struggling to get through the church doors. I ad at last squeezed through with great difficulty almost to the entrance of the temple, from which the life-giving Tree of the Cross was being shown to the people. But when I trod on the doorstep which everyone passed, I was stopped by some force which prevented by entering. Meanwhile I was brushed aside by the crowd and found myself standing alone in the porch. Thinking that this had happened because of my woman’s weakness, I again began to work my way into the crowd, trying to elbow myself forward. But in vain I struggled. Again my feet trod on the doorstep over which others were entering the church without encountering any obstacle. I alone seemed to remain unaccepted by the church. It was as if there was a detachment of soldiers standing there to oppose my entrance. Once again I was excluded by the same mighty force and again I stood in the porch. “Believe me, Abba, seventeen years I passed in this desert fighting wild beasts — mad desires and passions. When I was about to partake of food, I used to begin to regret the meat and fish which of which I had so much in Egypt. I regretted also not having wine which I loved so much. for I drank a lot of wine when I lived in the world, while here I had not even water. I used to burn and succumb with thirst. The mad desire for profligate songs also entered me and confused me greatly, edging me on to sing satanic songs which I had learned once. But when such desires entered me I struck myself on the breast and reminded myself of the vow which I had made, when going into the desert. In my thoughts I returned to the icon of the Mother of God which had received me and to her I cried in prayer. I implored her to chase away the thoughts to which my miserable soul was succumbing. And after weeping for long and beating my breast I used to see light at last which seemed to shine on me from everywhere. And after the violent storm, lasting calm descended. With these words she vanished in the depths of the desert. And Zosimas, falling down on his knees and bowing down to the ground on which she had stood, sent up glory and thanks to God. And, after wandering thorough the desert, he returned to the monastery on the day all the brothers returned. Touching the saint’s feet and asking for her prayers for the Church, the kingdom and himself, he let her depart with tears, while he went off sighing and sorrowful, for he could not hope to vanquish the invincible. Meanwhile she again made the sign of the Cross over the Jordan, and stepped on to the waters and crossed over as before. And the elder returned filled with joy and terror, accusing himself of not having asked the saint her name. But he decided to do so next year. Then on the opposite bank of the river, her face turned towards the rising sun, he saw the saint lying dead. Her hands were crossed according to custom and her face was turned to the East. Running up he shed tears over the saint’s feet and kissed them, not daring to touch anything else. Reading this the elder was glad to know the saint’s name. He understood too that as soon as she had partaken of the Divine Mysteries on the shore of the Jordan she was at once transported to the place where she died. The distance which Zosimas had taken twenty days to cover, Mary had evidently traversed in an hour and had at once surrendered her soul to God. And then he saw nearby a small piece of wood left by some traveler in the desert. Picking it up he began to dig the ground. But the earth was hard and dry and did not yield to the efforts of the elder. He grew tired and covered with sweat. he sighed from the depths of his soul and lifting up his eyes he saw a big lion standing close to the saint’s body and licking her feet. At the sight of the lion he trembled with fear, especially when he called to mind Mary’s words that she had never seen wild beasts in the desert. But guarding himself with the sign of the cross, the thought came to him that the power of the one lying there would protect him and keep him unharmed. Meanwhile the lion drew nearer to him, expressing affection by every movement. While he was still speaking the lion with his front paws began to dig a hole deep enough to bury the body. Again the elder washed the feet of the saint with his tears and calling on her to pray for all, covered the body with earth in the presence of the lion. It was as it had been, naked and uncovered by anything but the tattered cloak which had been given to her by Zosimas and with which Mary, turning away, had managed to cover part of her body. Then both departed. The lion went off into the depth of the desert like a lamb, while Zosimas returned to the monastery glorifying and blessing Christ our Lord. And on reaching the monastery he told all the brothers about everything, and all marveled on hearing of God’s miracles. And with fear and love they kept the memory of the saint. Abbot John, as St. Mary had previously told Abba Zosimas, found a number of things wrong in the monastery and got rid of them with God’s help. And Saint Zosimas died in the same monastery, almost attaining the age of a hundred, and passed to eternal life. The monks kept this story without writing it down and passed it on by word of mouth to one another. But I (adds Sophronius) as soon as I heard it, wrote it down. Perhaps someone else, better informed, has already written the life of the Saint, but as far as I could, I have recorded everything, putting truth above all else. may God Who works amazing miracles and generously bestows gifts on those who turn to Him with faith, reward those who seek light for themselves in this story, who hear, read and are zealous to write it, and may He grant them the lot of blessed Mary together with all who at different times have pleased God by their pious thoughts and labors. And let us also give glory to God, the eternal King, that He may grant us too His mercy in the day of judgment for the sake of Jesus Christ our Lord, to Whom belongs all glory, honor, dominion and adoration with the Eternal Father and the Most Holy and Life-giving Spirit, now and always, and thought all ages. Amen. In thee, O Mother, was exactly preserved what was according to the divine image. For thou didst take the cross and follow Christ, and by thy life, didst teach us to ignore the flesh, since it is transitory, but to care for the soul as an immortal thing. Therefore, thy spirit, St. Mary, rejoices with the Angels. Having escaped the fog of sin, and having illumined thy heart with the light of penitence, O glorious one, thou didst come to Christ and didst offer to Him His immaculate and holy Mother as a merciful intercessor. Hence thou hast found remission of transgressions, and with the Angels thou ever rejoicest.